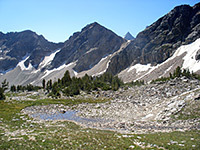 Canyons provide a course for most backcountry hikes in Grand Teton National Park, along trails that follow mountain streams up valleys which are thickly wooded at the lower end but become steadily rockier and less vegetated, as the paths climb towards the tundra zone above 10,000 feet. 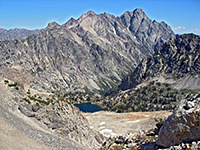 There are five main routes, along Granite, Open and Death canyons in the south of the park, and the adjacent Cascade and Paintbrush canyons further north, both of which may be seen by a strenuous loop hike of 19 miles and nearly 4,000 feet of elevation gain - quite possible for fit hikers to complete on one long day, though two primitive campsites en route allow for multi-day hikes. The northernmost drainage is accessed by the Paintbrush Canyon Trail, which passes spectacular and varied scenery over the 8 miles to its highpoint of 10,700 feet at Paintbrush Divide; starting next to pretty String Lake, the path climbs gradually up Paintbrush Canyon giving distant views of the much larger Leigh and Jackson lakes, and reaches another scenic lake (Holly) after 6 miles, set in a rocky, glacial bowl. The final section ascends through sparkling Alpine meadows beneath a jagged snow-covered ridge then crosses a steep scree slope, past a small glacier and on to the summit. 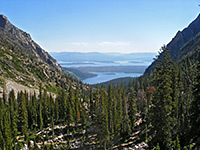 The continuation path has a steep descent to Lake Solitude at the upper end of Cascade Canyon, a long valley that is followed downstream for 6.5 miles all the way to Jenny Lake, from where the String Lake trailhead is 1.5 miles north. Besides the amazing views and beautiful scenery, the hike encounters many different habitats so is good for wildlife, and although the southern part of the loop (Cascade Canyon) is quite busy, especially the lower few miles, Paintbrush Canyon is quiet and peaceful. 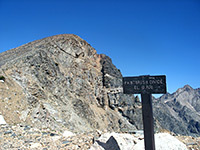 The full loop is generally considered to be the best long hike in the park. 19 views along the Paintbrush Canyon Trail - gallery, slideshow. Paintbrush Divide. Full screen version (21 mb). The closest parking area to Paintbrush Canyon is at the end of a spur road branching off the Jenny Lake Loop, just north of the start of its one-way section. There are plenty of spaces here, mostly used by people visiting adjacent String Lake, or nearby Jenny and Leigh lakes, both a short walk away. Trailhead facilities include rest rooms, drinking water and picnic areas, while food and lodging are available just down the road at Jenny Lake Lodge. If making the full 19 mile loop, the counter-clockwise direction is best as the elevation gain is done earlier in the day and the ascent is both more gradual and more sheltered; in summer even the high Tetons can be quite hot in some exposed places. 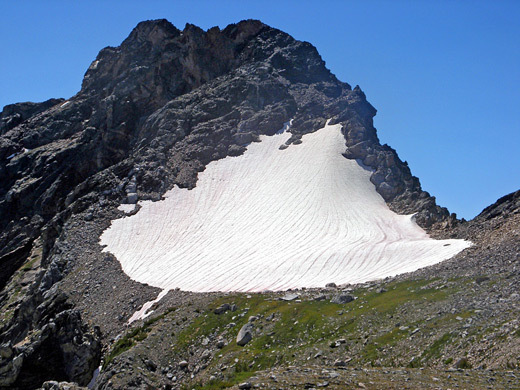 Also, steep snow fields in the upper end of Paintbrush Canyon can sometimes prevent easy progress even in July/August, in which case turning back here involves less walking than if starting from Cascade Canyon (distances to this point are 7.5 miles vs 11.5 miles). From the parking lot, the trail soon reaches the edge of String Lake and winds along the shoreline northwards through thick forest, with good views west across the calm, reflective waters to the steep slopes of Rockchuck Peak at the far side, catching the morning sunlight. After a junction, with the path to Leigh Lake, String Lake's inlet stream is crossed on a wide footbridge, followed by a traverse of a cool, sheltered area of tall trees, and a short climb up a steepish incline to another junction, after 1.1 miles. The String Lake Trail continues left (south), while the Paintbrush Canyon Trail heads north, still through thick woodland, around the hillside and into the mouth of Paintbrush Canyon, at first quite high above (and out of sight of) the streamway. The thick undergrowth, abundant vegetation and nearby water makes this ideal habitat for black bears, and the occasional grizzly, though these animals mostly stay further north, beyond Mount Moran. The trail flattens out for a while in the lower reaches of the valley, as the enclosing craggy hillsides of Mount Woodring and Rockchuck Peak become properly visible for the first time, and then crosses a few small streams before approaching the main creek, rushing forcefully down a boulder-filled ravine. The lower Paintbrush Canyon primitive camping zone begins here and extends for about half a mile, offering many nice sites in sheltered clearings between the trees. After crossing to the north side of the stream, the path starts to climb more earnestly as the fir/pine/spruce trees become smaller and less dense, mixed with open, rockier areas which soon predominate. The route switchbacks up a steep part of the valley - the surroundings are now an enchanting combination of white granite boulders, green grass and multicolored wildflowers (including the red Indian paintbrush after which the canyon was named) - then has a long straight section up to a second junction. Both branches meet up again; the left fork is a little shorter but the right fork is preferred as it leads past two scenic lakes. 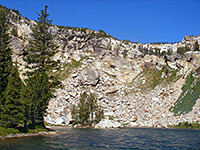 The first is small and nameless but still pretty, backed by a grassy, bouldery, slope, while the second (Holly Lake) is bigger and even more picturesque, ringed by grassy, mossy rocks, enclosed by granite hills on three sides, and with the high crags of Mount Woodring rising steeply above. Holly Lake is a good destination for a shorter day hike, being 6.2 miles from the trailhead. From Holly Lake the trail climbs a shallow, grassy ravine to the junction with the other branch, around which is the upper Paintbrush Canyon primitive camping zone, then continues towards the far end of the valley, start of the most scenic section. The landscape includes short grass meadows, shallow meltwater ponds, wildflowers and snowdrifts, surrounded by stark, jagged peaks in all directions but especially to the south, where the steep slopes harbor several glaciers. The ascent steepens steadily up to a saddle at the head of the valley - a narrow ridgetop giving great views back down the canyon and over vast, mountainous scenery to the north, of endless rocks, cliffs, crags, ravines and glaciers. This is not Paintbrush Divide, however, as the path still has another 600 feet to climb, up an angled scree slope above a small glacier, a section that is usually snow-covered and may be difficult to cross (an ice axe and/or crampons may be required in early to mid summer), followed by the rockiest part of the trail, zig-zagging up a pile of loose, broken boulders to the 10,700 foot high point of the divide, soon after which Cascade Canyon comes into view to the south, containing Lake Solitude at the upper end, and inaccessible, turquoise-colored Mica Lake to one side. The divide is liable to be very windy though there are large boulders to shelter behind, also home to an active population of marmots and pikas. All around are other glaciers and jagged cliffs including the summits of three Tetons to the south and Mount Moran to the north, mostly completely free of vegetation. 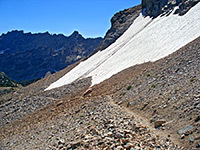 For a short side trip, an unnamed summit a short distance northwest provides less-obstructed views of lands to the north, while the main path soon begins a long and steep descent into Cascade Canyon.